Would work well in stalker. Exoskeleton and gauss rifle when fighting mercs, by the time you get to NPP just a makarov and no armour. That'd show skill. Wasn't really meant for emphasis, just to set it apart from the rest of the post, but if it's that troubling to the eyes I'll change it to Italic. Thanks. It's an interesting idea to be sure and the general idea is worth looking into, but doubt it would work for most kinds of games, especially MMO's. One reason why you start off a game weak and with the bare minimum of tools is so players can learn the basics and gradually learn new skills as they are introduced. For example in WoW the game started you off at level 85 and dumped the whole collection of spells on you at once, I would think most people would feel overwhelmed and just give up after a few min...especially newcomers to a genre. Honestly I think that the problem of a game becoming too easy toward the end is a sign of poor game/level design than with the leveling system. If the player gets stronger, faster, smarter, etc. then game designers need to make the enemies and levels grow as stronger, faster, smarter, etc. as well so they are always ahead of the player. Ooooh! If I ran a video game company, I'd "borrow" this idea for further evaluation. It's interesting but I doubt it could work as an MMO, at least not currently. I actually DO play some games to make my character get stronger as I go, I enjoy defining him and his abilities. A game like this would have to be more based around the story, which while WoW certainly has some, it isn't exactly the prime focus. This idea seems like, for the most part, it's too contrived. There's a lot to be said for games where you start off with all your powers, via preview or "soon to be lost," but even that would get tiresome. This would need to be heavily orchestrated every time, and it would get old fast. However...I see a bit of a contradiction in that at the very end of the game....the Final boss will essentially have to be the weakest enemy you fought throughout the entire game. Which kinda takes away from his status as being the King Pin of the entire games complication. Who knows...you could chuck an Ichigo from Bleach and even though you cant stand and have lost an oceans worth of bodily fluids, you still manage to fill up your angst meter and blow the surrounding terrain into grains of sand and clumps of boss meat. Lore Sjoberg once did a Capybara Brothers comic on something like this. 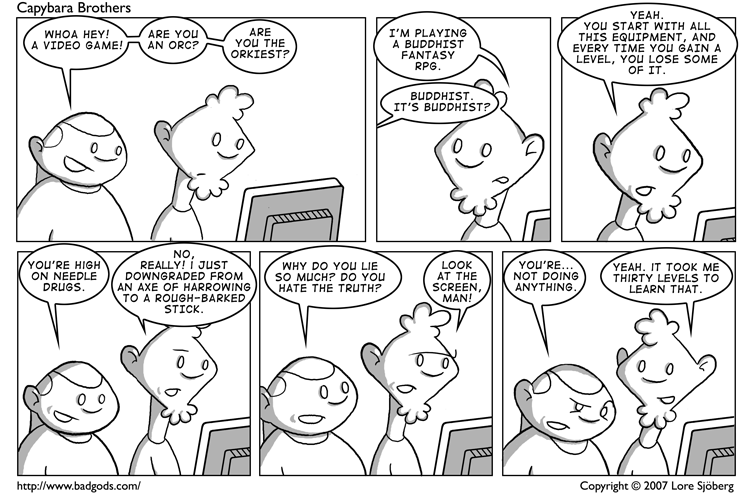 Called a Buddhist RPG, the player had just traded in his axe for a stick. Shame his site is down, otherwise I'd link to it. I think this is the right link. Hey! Found my local copy. If you win the game, you don't have to play the sequel. crazy idea for RPGs that might actually work. I like the concept and think it could work well, but the reason for giving up spells seems a bit contrived. If you had tasks ahead of you that you knew would weaken you once they are completed, you would be at the very least hesitant when choosing the next task to go after. What it needs is something else that takes the abilities away. With the tasks no longer being the catalyst for losing abilities, the player is far more likely to want to do them. I'd have a story where some sort of intangible evil has spread over the land and is sucking up all the magic, and no matter what you do it starts draining your abilities. The player is made to understand that if they do not act, and act fast to find this evil and rid the world of it, they will be reduced to a helpless wreck. Now the player will want to blaze through their tasks with gusto, and the story remains a tense race against time as they seek out the source of evil, knowing that the spell they love to use the most could disappear at any moment. Game saving would need a careful think too. Man, this is a fantastic idea. I don't mean this sarcastically either. What if new players started out as a big bald man with so much power that all he needed to do was button mash to win. A blank slate. Then the villain shows up and curses you, which explains the gradual loss of power. There DOES have to be a trade-off however. I'm thinking better customization and traits with cooler combination moves. A world that admires your power loss with and finishes with an epic ending. Like say in the end, you've become an old, weak man. The villain that cursed you now has all your power and looks exactly like how you started out. You beat him with all your acquired moves and timing and maybe die or something. The world you've helped in your quest builds a statue of you in your honor or something. I go to school in Burlington, VT. for Game Design. A team two years ago actually created a game along these lines called "The Eve" that begins with the final boss fight, and then the player must slowly sacrifice their abilities in order to get closer to their love. The levels were themed on the pitfalls of relationships- Pride, Jealousy, Lust, and I believe Deceit. The player chooses an ability- double jump, shield, attacking, and crawling- to sacrifice at the end of each level. They can also end the game early by sacrificing their love so that their love can be free of the curse you're working so hard to undo. The concept was brilliant, as each sacrificed ability cut off many easier paths in each level. I feel like it's proof of concept for this kind of play. Could I buy their product? I mean I'm not interested in the code, I just wanna play this thing. It sound really interesting! Unfortunately the school legally owns the game because it was produced using their equipment, and it was just a school project and not intended to be sold. I tried to look for it online, but unfortunately I couldn't even find a Youtube video of it! Sorry! Actually, here's a simple idea for making it, or something like it work: just treat wounds like real-life wounds. No automatic healing up, no magic potions, none of that. You could still have all these skills and items at the end of the day, but you can also have bad knees, repetitive stress injuries, fucked-up hips or tendons. Given the ultra-violent lifestyle led by the average game character, that'd compel a pretty interesting change in style of play. ...Up until the point where you beat the bad guy, and then you're back to Godhood. And the badguys will never change...in fact they're going to have to get weaker...or you'll be grinding. Then that's exactly what happens anyway...the levelling is just an illusion, up or down. I like the concept for something like SoTC, where you don't really level up anyways so you could simply slightly weaken each time to up the difficulty, but for any type of RPG it would fail for one main reason: Sidequests. I'm one of those players who likes to do every little thing in a game and max out characters and such and take the side paths whenever possible. This means usually I end up overpowered but I'm still enjoying the experience and I get rewarded by feeling like I'm stronger because of it. If I'm leveling negatively then it basically punishes those who like to stray from the main path and will make the main quests more difficult (or even possibly impossible to accomplish since you can't grind to make it easier since it will simply get even harder) so it will discourage exploration and instead encourage a player to simply rush through the main story and not enjoy any of the rest of the game. THAT is a HUGE downside for me and anyone else who enjoys exploring the game world whenever we want. I think this is an interesting discussion to have in order for us to fully understand why we have the concept of levels and characters gaining power, but it speaks more to pacing and overall gameplay. You mentioned the hero's journey, and I think that can still happen while the character gets more powerful, as the character still has plenty to lose other than his abilities. Friends and family can die, old beliefs can be shown to be false, the longtime enemy can turn out to be a friend and the trusted advisor a vile traitor, and so on and so forth. You can strip someone down from who they were, weakening and destroying the old self while still allowing them to throw a mean punch, cast a better spell or shoot a gun better. The hero's journey isn't about growing weaker, but about being cast away from anything and everyone the hero knew or cared about, being brought to the very edge of doubting who and maybe even what he is, and then emerging into the new identity of the hero (or failing and falling into darkness and death). It would best be handled in a single-player game, as your own discussion shows how ultimately ridiculous it would feel in an MMO setting, at least the way we understand MMOs today. It risks feeling very gimmicky and forced, and the more I think about it the more I wonder if it would really be properly handled as a game or if such concepts really only work in a more traditional narrative structure, as opposed to something interactive. This article made me think of Desktop Dungeons. This game does not level backwards, but it does have an extreme focus on resource management. I think sidequests in Yahtzee's game would have to be a resource. You could gain the respect of a region, in exchange for aging. You couldn't spend all of your time rallying troops, you have to charge Mordor eventually. This is an interesting idea, but it's kind of hard for me to imagine a game like that. If there was one I'd certainly try it, give me something different. Hmm... perhaps instead of leveling down skills and what not maybe your drained of your equipment and resources, maybe your character is exhausted and you progessively slow down and do less _________. The idea that leveling down seems to be an interesting one, i will admit that. But one of the reasons i believe people play games is to feel empowered. Stripping a god-king of his powers until he's nothing but an insignificant bug, may be a good story, but it falls flat unless the entirety of the game is flawless. What i think is that the spells you do use level up, but PAINFULLY slowly (based on number of enemies killed(no hold down spell button infinite experience)). In this way you still give the player a way to feel more powerful,but still give them a feeling of powerlessness at the same time. I do like this idea, like you said it needs a good story element to make it work. I dont care what it is, a curse, a disease, anything just to make it acceptable. I recently completed Demon's Souls, great game by the way, and once I got the demonbrandt, I believe, in world 1-1 after defeating Old King Doran I was able to breeze through the entire world 5. World 2 was challenging, 3 was confusing in the jail but the bosses were easier than most, 4 was fun with a good final boss, and World 1 especially 1-3 and 1-4 were a good challenge. However with new sword in hand world 5 was to easy the bosses were jokes and the only problem was the poison and slow effect of the swamp of 5-2. This can be changed with limiting grinding and such but thats not the point. The point is balance, this sword I had gave me such an advantage it was ridiculous. And the problem with open-world games is balance, sure 3-1 has easier enemies than 3-2 but they need to me equivalent to the 4-1 and 4-2 respectively. So in addition to having a reason the game must also be fairly linear so a player does not jump to a harder area with near max abilities and slowly works down by jumping around. The balance and pacing need to be spot on for this idea to work, but if it were to succeed the game could be great. Great idea! I wouldn't mind seeing a game, maybe a series, based on this idea, but I think the standard for RPGs should always be facing stronger enemies, not becoming weaker as you progress. While compelling from a story point of view, I prefer having more access to gameplay options over time. The opposite kills replay value immensely, something I treasure a lot in a game. In terms of gameplay, too late. This idea has been done in a Rogue-like called A Quest Too Far. Which was made in 7 days as part of the "7 Day Rogue-Like" event. It's not fantastic though. Although for a game made in a week it's understandable. These ideas work in a single player world, never in a MMORPG. In WoW, people play to "be the best of their class in the planet earth". Hence, the repeated raiding of the same boss until you have two of the same X, or complete your Y set. Nobody is going to play end game content where you kill level 1 lizards to get "paper breastplate - beginner", having slayed thousands of wizard-gods in the start of the game. I really like this idea, in a way. If nothing else, more developers should spend some time thinking outside of the box. I see this failing as an MMO idea, but fitting very well into a tragic story. I liked the idea you pitched of starting as a revered and respected champion of your kingdom, having to fight an ongoing war of phyrrhic victories against the villain, reaching the final battle with you on your last leg and only your strength of will keeping you going. I sure couldn't see a happy ending coming out of such a story, though. In Diane Duane's "So You Want to Be a Wizard" series, younger wizards have more power, while older wizards have skill. It works well (and makes sense) in a fictional universe populated by fictional people, and it might even work in a real universe populated by real people. It wouldn't, however, work in a fictional universe populated by real people, because it assumes that no one will ever go back and start a new character. I don't know anyone who has only one character in WoW. I think it would work better in a shorter game, centred around one aspect of a larger story. For example, a downloadable game about the Battle of Helms Deep from Lord of the Rings, wherein you'd start off with a full set of well-maintained equipment and ample Stamina/Mana and Health, but it gradually wore down along with the battle. Eventually you'd need to start making use of rocks, Orc/Uruk weapons, or use the dregs of Potions lying about just to survive a one-on-one encounter. It would probably be better for a sidestory to say, Red Dead or Dragon Age, as we know how Helms Deep ended. That can be an interesting element, but I think it would be a serious downer for a gamer to play the first level and know that he'll never have more fun than that. Why not a bell curve? Why not a game that follows the rise into your prime, and then the fall afterwards? If the first half manages to get the player invested in the character he or she is playing and the world they inhabit, then hopefully they'll stick with it once the stats start to ebb, the equipment starts to degrade, and the super powers are lost. As an aside-- what distinguishes this from the "degrading equipment" mechanic, which Yahtzee hates? "I couldn't help noticing that the bottom and sides of my screen had gradually become wallpapered with miscellaneous spells, some of which I never used at all. If the player started with all of those, they could decide straight away (well, after some experimentation) which ones best complimented their play style, making the choices of what skills and spells to get rid of initially easy and increasingly heart-rending." I think the current system whilst effective is showing its age, the on screen clutter can reach overwhelming proportions (especially with the addition of UI mods, despite the fact that some of which are designed to remove some of this unnecessary clutter). That is why I agree that something must be done, or at least, altered so that their are more UI minimization options, perhaps. So, basically, Lord of the Rings. Start out with armour, weapons, food, sanity etc., and end up having to fight tooth and nail to even get up a mountainside. While I wouldn't want all my stuff to be lost/useless, I'd appreciate gaining the strength and powers to even BE ABLE to combat the later stuff, rather than gaining them to walk over the enemies with ease. This may be just nucking futs enough to actually work! Yahtzee, you mad genius! If done correctly, this concept would work very well. But you would have to walk a very fine line for a game made using these mechanics. My idea would be to start with a variety of magical powers, but a limited combat ability; so as you progress through the game, at certain critical points and battles you are forced to expend large amounts of magic, growing weaker and losing many of your starting powers, but gaining combat ability to show that while your character loses his initial powers, he is still learning and growing, gainging powers of a different nature. I see a lot of potential, specially from a story telling point of view, but also in game mechanics. While your initial powers are mighty, the progress of the game gives you more range in combat, unlocking more moves and weapon choices as your magic withers away. The concept would work well with a god-like character, who comes down to a fantasy land to stem the tide of some dark foe intent on bringing about total destruction of the world. The idea is that the longer you spend in this world has a side effect of making you more and more mortal, and by the time you reach the end of the game, you have lost all divine power, and must now fight to save the world as a mortal against godlike beings, the inverse of the beginning, where you were a godlike being fighting against mortals. It works well as a game play mechanic and for character growth as well. When the protagonist first arrives he is haughty and self righteous, acting like a god among mortals, simply assuming that with his mighty powers he can set right all that is wrong with ease. But as things progress, and he is forced to become more and more human, coming to terms with shades of gray and making moral choices that a god has never had to contemplate before. How about you start at these godlike levels and you lose the gradually until about halfway through the storyline and then when your at rock bottom, you have an intervention and begin building back up to your godlike status reclaiming your powers? Kinda like the beginning of God of War 2 but more gradual. You might want to look into The Void. It's got that tense race against time, as your Color (health) constantly ticks away and you need to keep seeking out new sources to feed on. Anyway, for this idea to work, you need to make sure you don't remove any game mechanics entirely, since an experienced player wants a more complex game. So I think that you should make each power harder to use, so that the player needs to be more inventive with limited resources, but keep it essentially the same. So your Generic Powered-Armor Space Marine starts out in a big sandbox full of dudes to shoot with a BFG and a jetpack and super strength and a gravity gun and his own theme music. But as the battle wears on, he gets limits on each of his abilities. His BFG runs out of batteries so it now has limited ammo and he has to scavenge. His jetpack is damaged and it can only fly for 10 seconds at a time. His super-strength is weaker and he can only throw bricks instead of cars at his foes. So you still have all the abilities, but you can't abuse them to obliterate everything in your path. You have to think carefully about how to use them. What if you have to line up your enemies so you can get them in a single shot? Your jetpack will let you leap across the chasm, but can you find a safe place to rest while it recharges? It also lends itself to a bunch of other design benefits. Giving them all the abilities at the start lets you train the player in more clever uses that they'll need. For example, you could put a bunch of enemies in a clump to let the player see how to get them all with one BFG shot. You could also give the player a breather by giving them a temporary boost back to full strength, so they can relax and go on a rampage. Or you could force the player to redo an earlier section with their limited abilities, so they can see how much stronger they've become.